Chair of the AFL Commissioners and renowned Chief Executive of Wesfarmers, Mr Richard Goyder AO was special guest speaker at the inaugural RWB Winter Morning Breakfast event. As one of our most respected corporate captains of Australian business and of Australian football, Mr Richard Goyder AO was invited to speak on"Innovation in Football and Sport – Business Parallels". RWB members and guests were privileged to hear Richard's wisdom and business insights. “Innovation is a constant in any business if it is going to thrive” said Richard. Asked about the AFL Commission’s plans for AFLW, Richard acknowledged the immense demand for womens’ football and this being “the AFL’s biggest opportunity”. Corporate support was strong and the Clubs who don’t have a womens’ team know they need one for fear of loosing brand equity. A drinks party was held to promote greater female participation in the RWB Network. Ms Sally Capp, as inspirational career professional and Victorian Chief Executive of the Property Council of Australia, shared her networking tips to members and guests at our Women's Drinks Party in May 2017. Sally has held senior executive roles across the private, government & not-for-profit sectors and acted on a number of Boards over the years. As the first woman on the Collingwood Football Club Board and the first female Agent-General for Victoria, Sally was well qualified to share her experience and advise "How to network effectively in a room full of men”. Well known to the RWB membership in her roles as Forever Foundation Board Member, Founder of the Susan Alberti Medical Research Centre, Vice President of the Western Bulldogs Football Club (retiring at the end of 2016) - champion and supporter of AFLW, and tireless fundraiser and philanthropist for Juvenile Diabetes. 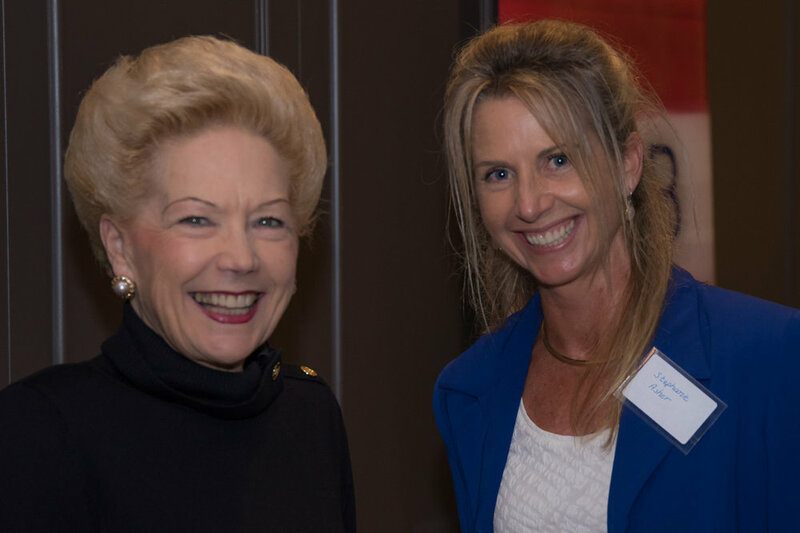 An inspiration to all at RWB, Susan Alberti AC has spoken at several of our functions to promote participation of women in the RWB Network, and to embrace the opportunities opening for women in sports leadership. Susan encouraged women to embrace the 'golden opportunity' of our the RWB Network to further develop business relationships and support. Continuing with our mission to increase female participation in the RWB Network, a very special breakfast was held in The Australian Club with guest speaker Stephanie Asher. Wishing to promote the value of networking, and inspire our female members to embrace the opportunities around them, RWB Member Stephanie Asher was asked to share her personal journey and experience of “Living comfortably out on a limb”. Stephanie Asher is a successful writer, publisher and PR consultant. Stephanie is also the author of newly published The Footy Lady - the biography of Susan Alberti AC and recently elected as Councillor for Bellarine Ward on the Greater Geelong City Council. Stephanie left behind the safety of a successful corporate career in Melbourne to relocate with her family on the Bellarine Peninsula. She went on to develop her a private consultancy business and found herself running for Mayor (twice) in Geelong election campaigns. With humility and great insight Stephanie encouraged RWB members to take the untrodden path - not to let fear stand in the way of trying something new. “There is no failure when we go out on a limb - we can only Win or Learn"
PwC CEO Luke Sayers warmly welcomed the RWB network to the Innovation Centre at our Inaugural RWB Winter Morning Breakfast in July 2017. RWB members and guests were taken on a tour of the stunning offices. The new PwC headquarters have been designed to represent the changing culture of PwC - valuing collaboration and innovation. Luke spoke of PwC embracing the ‘art of difference' showing support and corporate leadership for a diversity of gender, skill sets, different backgrounds and religious beliefs. Luke congratulated the Forever Foundation on the RWB Initiative being “a great example of innovative thinking”.